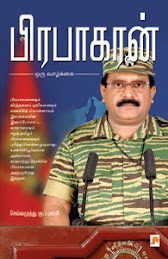 Chellamuthu Kuppusamy: Tata steel & Corus - Are we cheering?? Tata steel & Corus - Are we cheering?? Three exciting things involving India and England have occurred recently. Shilpa Shetty winning big brother show in UK amidst racist comment by fellow contestant is certainly interesting. British telecom major Vodafone fishing for Indian cellular operator Hutch is seen as the recognition of India growth story by advanced countries. (NYSE taking a stake in largest Indian stock exchange NSE can be viewed under the same lines). While these two events are certainly noteworthy, what is fascinating is Tata steel's acquisition of British steel maker Corus. This is the largest takeover by an Indian firm overseas for an all cash deal of $12.1 billion (Rs 53,361 crore). Tata's had to offer 608 pence per share. This is 5 pence more than rival bidder CSN, a steel company from another growing nation Brazil. While the entire India Inc is celebrating this news, we don't have any disregard towards this brave attempt. Neither can we ignore it as an irrational exuberance, though signs of that are exhibited. "Today marks the end of the journey that started quite some days ago. An Indian company is making the bid for a European steel company much larger than itself — it is something which has never happened," Mr Ratan Tata, Chairman of Tata Steel, said. Tata steel – Corus combine would be the fifth largest steel producer in the world. 19 million ton capacity is added to the kitty. A company is taking over another bigger than itself. One can't forget IT bubble towards the end of last century and the first few months of this century when unknown IT companies swallowed firm larger in size to bulge the balance sheet & book value. Sure, it is not fair to compare the Tata's with any of those 'get rich quick' dot.com companies. However, there is an apprehension that Tata is biting more than what it can chew. 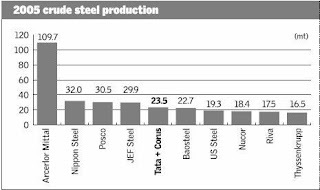 Tata steel being one of the cheapest steel producer in the world, deserves due admiration. This acquisition would help it spread wings globally, Europe in particular. 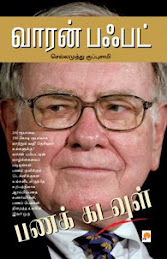 Finance minister P.Chidambaram has assured that the central government would facilitate this deal go through smoothly. Any flexing of rules from SEBI or RBI should not be a big problem. But, the main question remains the price. While one compares Tata's initial offer of 475 pence a share with the final deal of 608 pence, there lies little difficulty in determining it to be a high priced shopping. Hindu business line reports, "The 608 pence offer is at a premium of about 68.7 per cent over the average closing mid-market price of 360.5 pence of Corus on the LSE for the 12 months ended October 4, 2006." But, Tata steel's MD Muthuraman justifies the price. "At 608 pence a share, the enterprise value of Corus works out to $710 per tonne. Today, to set up a greenfield capacity, going downstream as much as Corus has in terms of tin plate capacity, galvanising capacity and construction solutions anywhere in the world, would cost somewhere between $1200 and $1300 per tonne"
But, overvalue or undervalue varies based on the yardstick we use. The final deal for Corus at an enterprise value of over $13 billion works out to multiple of approximately 7 times EBITDA (earnings before interest, tax, depreciation and amortisation) for the year ended December 31, 2005 and 9 times for the 12 months to September 30, 2006. This is much higher than 5.5-6 times paid by Mittal for Arcelor. On an EV/tonne basis also, the deal works out to $710 per tonne, higher than the Arcelor Mittal deal, though in line with some of the standalone deals in this space. Alright. How does the stock market see this transaction? Tata steel share price took a beating by 10%. Nothing more to add. Highly leveraged purchase would burn a big hole in the bottom line and net profit margin. A mammoth task is ahead of Tata's to unite both the entities both in terms of operation and culture. How can one summarize this? Corus shareholders can start running towards their bank with all smile and 608 pence money. I am concerned with lot of caution as a Tata steel shareholder and feel proud as an Indian. This mega purchase is going to be funded by 53:47 debt-equity mode and has happened on the day when RBI hiked repo-rate by 25 basis points. At the end of the day 'it is a matter of pride'? Neeeeyyy. Note : Facts, figures and news quoted from Business Line.